You, Me and Movies: "Miss Sloane" presents an abhorrent political backdrop! "Miss Sloane" presents an abhorrent political backdrop! The year 2016 has been a strange year politically, and I think "Miss Sloane" is no doubt perfectly timed. While dealing in the world of political lobbying and not in the worlds of senators and presidents, but its still an effective piece about about the do's and don't's of politics and how its sometimes a competition and almost a game. 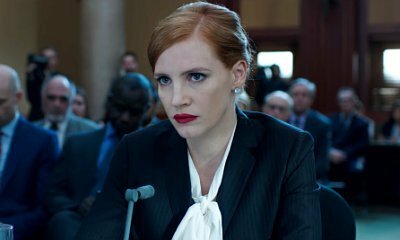 We meet Miss Sloane (Jessica Chastain) in a meeting with her attorney as the film opens. They are prepping for a trial of some kind and it quickly becomes evident that Miss Sloane is in some kind of trouble with the law. She is presented before a group of senators including Senator Sterling (John Lithgow), and after every question thrown at her, she simply refers to the fifth amendment. Whatever kind of pickle she's in, its clearly serious and you are left wondering if she is truly guilty of something. Its an astounding way to begin a film and it definitely ropes you in. We learn that Sloane is a no-nonsense, thriving, destructive lobbyist for the political right. She is very good at what she does, and has garnered a successful yet somewhat notorious reputation. If there was any time to brainstorm a crazy crossover with other popular culture, I would absolutely loose my mind if Miss Sloane ever met President Frank Underwood. But I get off topic. She is eventually introduced to Senator Bob Sanford (Chuck Shamata), who a gung-ho gun supporter trying to improve the female vote. He presents his ideas to her, and she completely laughs him off, which gets her in trouble with her superiors. She can't help it though, she may work for the political right, but she has an informed opinion about guns. Somehow this meeting with Bob Sanford creates an epiphany inside of her and she jumps ship to lobbying firm run by Rodolpho Schmitt (Mark Strong) who are pushing for a bill that will change how easily people can buy guns in this country. You may be sensitive about the gun issue in this country, but the film isn't interested in shoving a political agenda down your throat. Instead, the movie is about her lobbying firm clashes with her old lobbying firm in order to get the new gun reform bill passed. Sloane uses any means necessary, whether they are ethical or not, to get this bill past. Why not? So is the other side. The thing is, Sloane is completely unpredictable, and there is no telling what she has rolled up her sleeve at any given moment. If "Miss Sloane" works for you, part of the reason why it will is because Jessica Chastain is so relentless in the lead role. She is definitely sending her to the front rows of the Academy Awards next year, no doubt. Will she win? Not sure, still got some other big leading lady performances to see, but as of right now she's got a hot ticket. She's never come off this alive before and she really keeps this ship moving. She is well helped by an incredible ensemble of supporting actors, including Strong, Alison Pill, Gugu Mbatha-Raw (whose performance should generate a very special recognition and could be an early contender for supporting actress), Michael Stuhlbarg, Jake Lacy and Sam Waterston. All of whom do great work. Its a pretty smart and sophisticated script by Jonathon Perera except for maybe that ending. You are either going to flip for the ending or you are going to declare it a waste of time. I think Chastain handles the ending scene very well. But there is a little bit of phoniness to it. I feel as if there is a little too much convenience laced in the last five or so minutes, and that kind of took me out of the experience. I think its the moment that will divide audiences the most and how much you've been paying attention will determine how well it works for you. I find myself somewhere in the middle, I liked the ending, but its a little nonsensical. Truth be told, we don't have too many smart political dramas and it was about high time we had one. I think the main reason to see the movie is to see Jessica Chastain throwdown. She does incredible work and it will be duly noted as the year comes to a close. The cast as a whole does a good job, just don't be surprised if the film falls apart slightly at the end.